The Joseph Joseph Elevate Carousel Set solves two problems for the price of one. And that’s not even considering the amount of kitchen tools this one set contains. 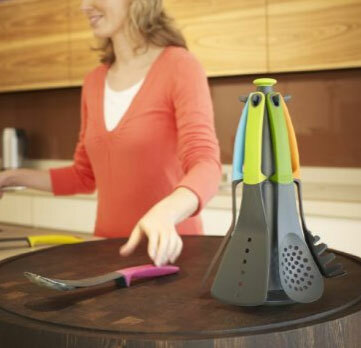 Called ‘Elevate’ for a reason, the utensils feature weighted handles, allowing for tools to be rested on the counter without the business end coming into contact with the surface.